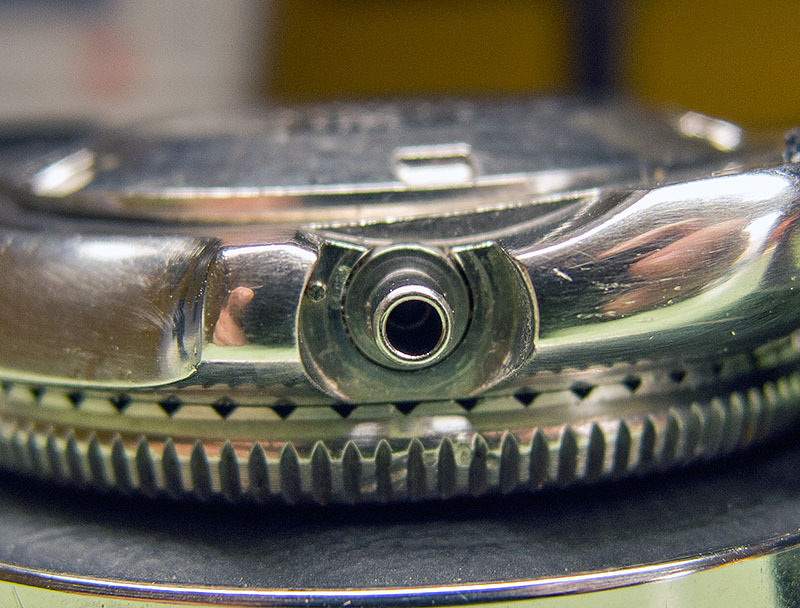 The modified watch, in my experience, peculiarly appeals to the vanity of its creator rather more frequently than it does to those called upon to admire it. 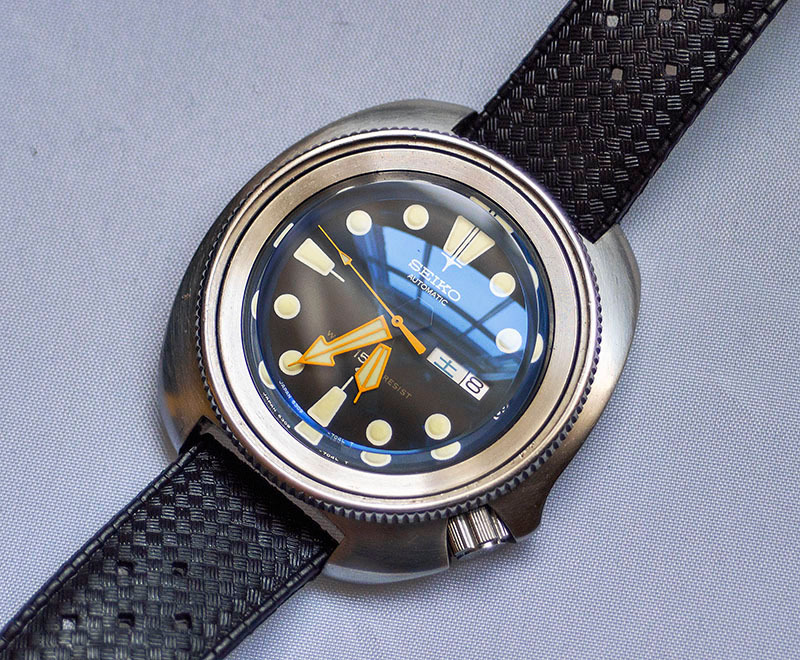 It is a construction of parts from disparate sources, commonly including cottage industry-produced components designed to fit the more popular models (usually divers watches) and aping the classic designs of the established marques. 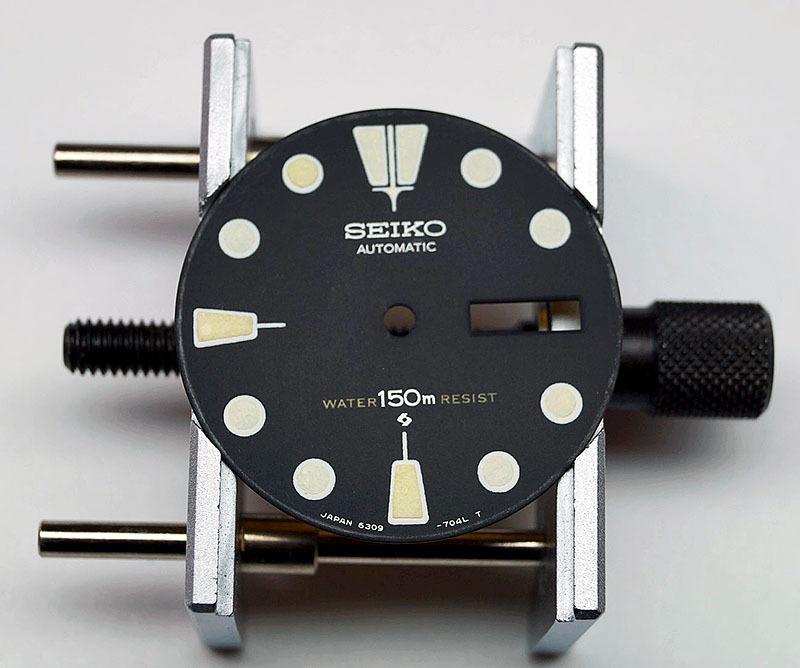 For obvious reasons, Seiko is a brand used most commonly by the ‘modder’ not least because of the easy availability of numerous donor watches from past and present and because they can be purchased relatively, or indeed, very, economically. 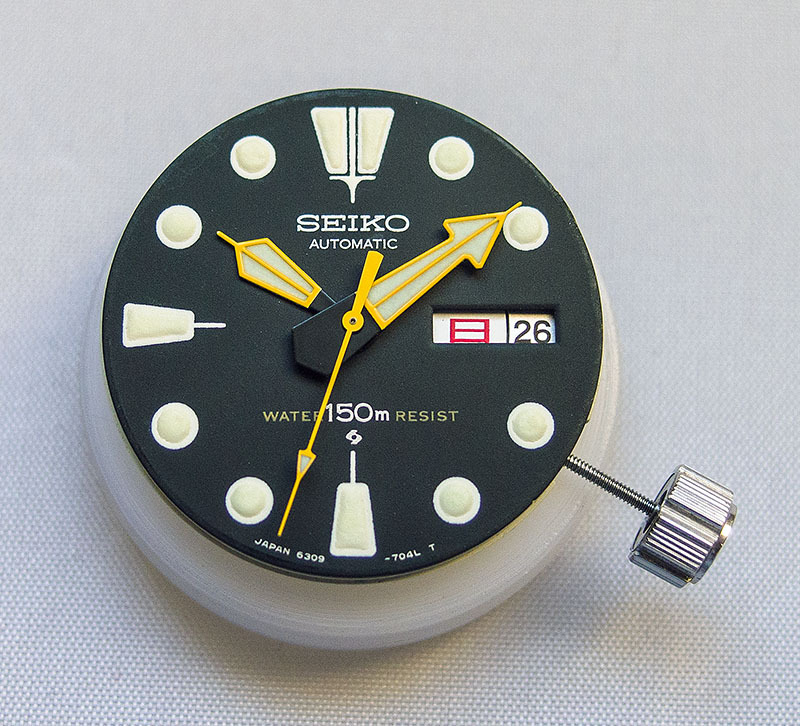 Seiko appeals too because of the easy interchangeability of parts, particularly when you get your eye in and recognize compatibility between cases, movements, dials and hands. 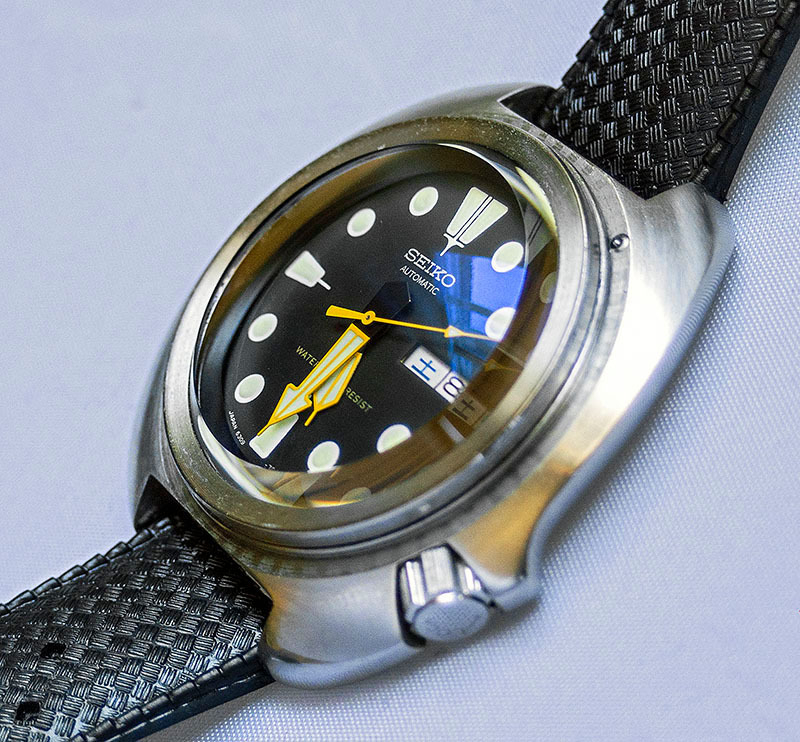 The most commonly modified Seiko watch is undoubtedly the SKX007 divers watch (see here for an example), rated to 200m and featuring the ubiquitous 7S26 movement. 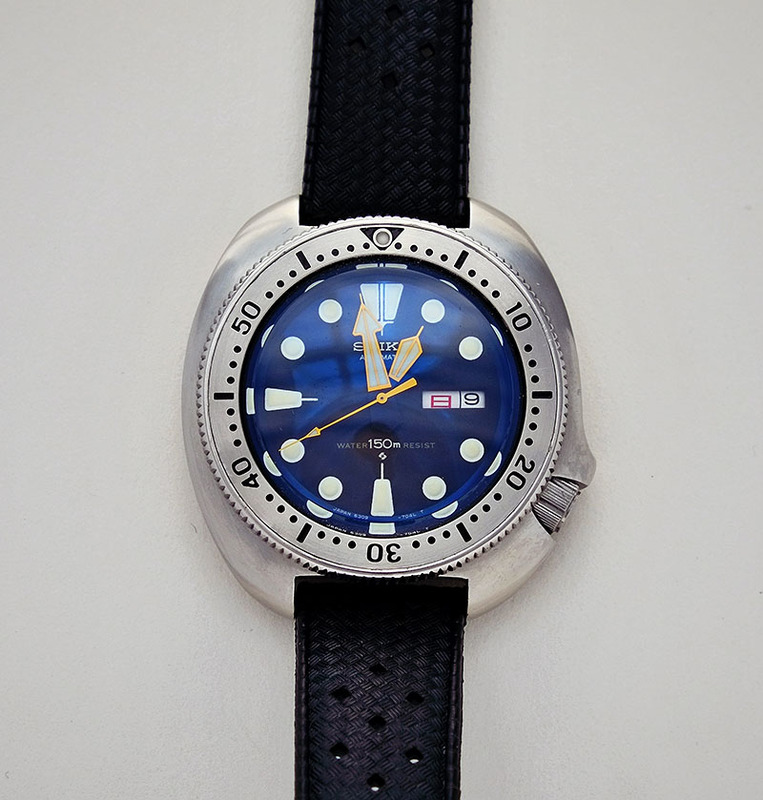 A few years ago, there was also a vibrant (after)market in parts for the 6309 divers (some examples here). 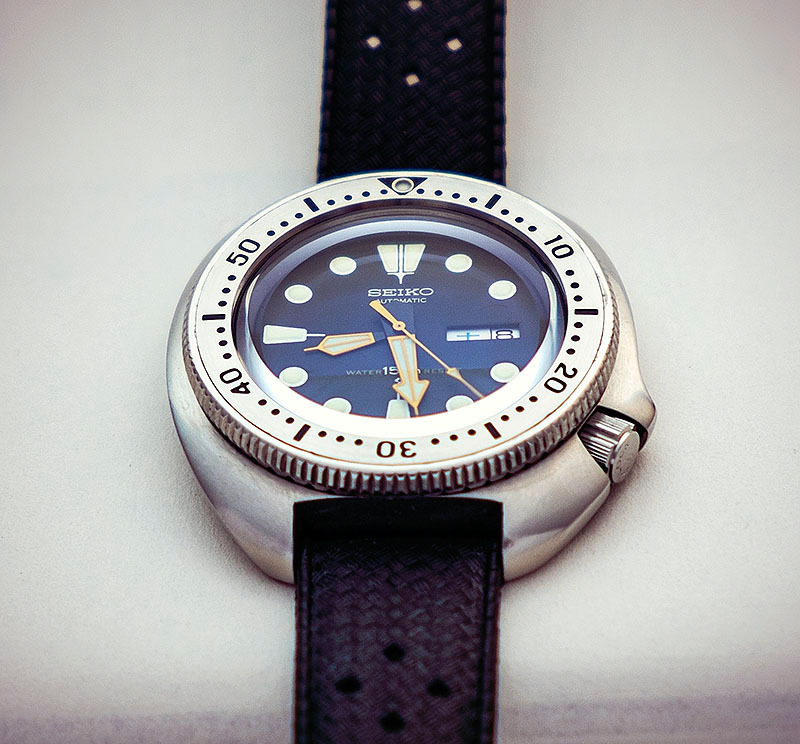 Nowadays, Seiko 5 sports divers watches are being modified to resemble Blancpain 50 fathoms or Tudor Black Bays. 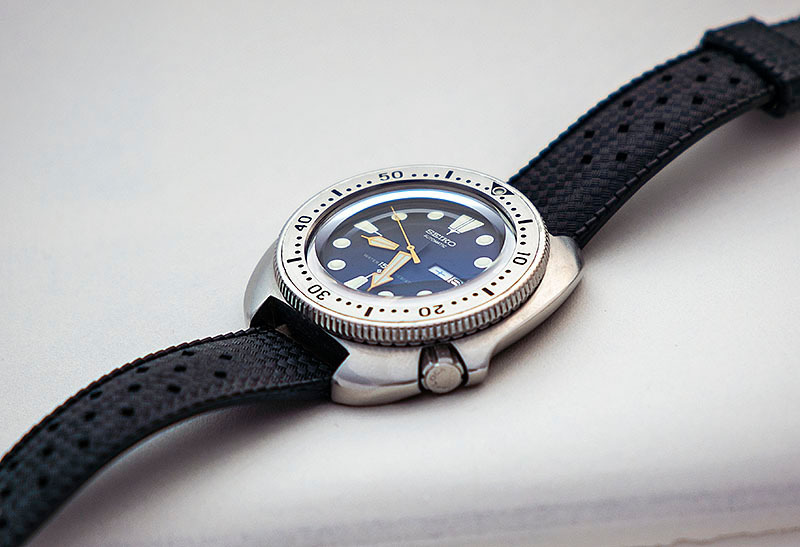 The subject of today’s adventure uses as its base the 6105-8110 diver of the early to late 1970’s, a watch occupying a pricing tier a notch or two higher than the common and garden 6309 and 7S26 divers and consequently not so commonly used as the basis of a modified watch. I would never normally dream of corrupting such a classic but have done so twice with a clear conscience. 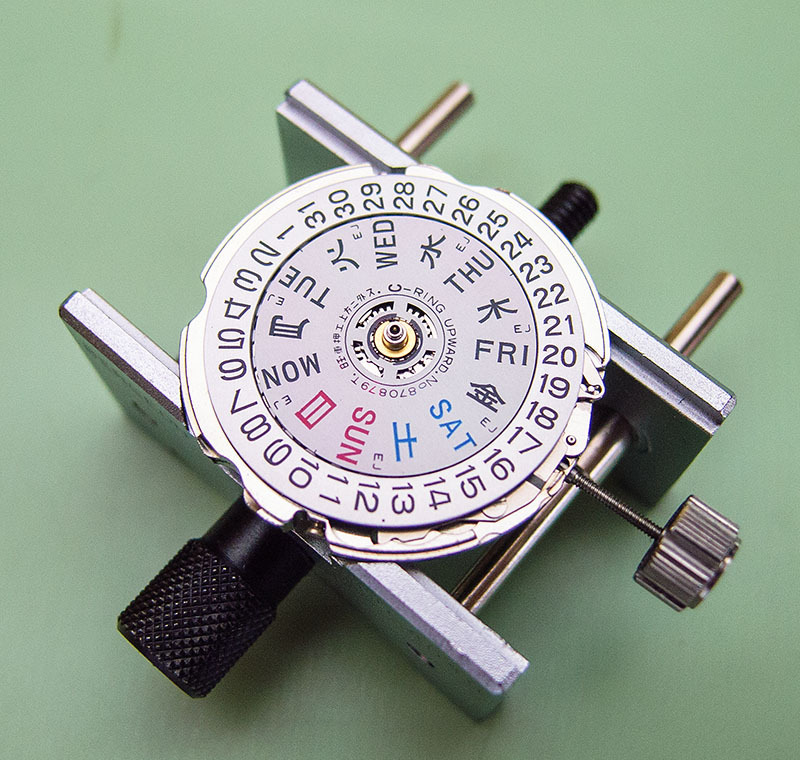 In the first case, it was as a pragmatic means to rid a basically decent example of a hateful aftermarket reproduction dial (see the first post in this here blog) but the basis of this present project was an empty but otherwise complete case purchased from Ebay and in need of a movement, dial and hands. 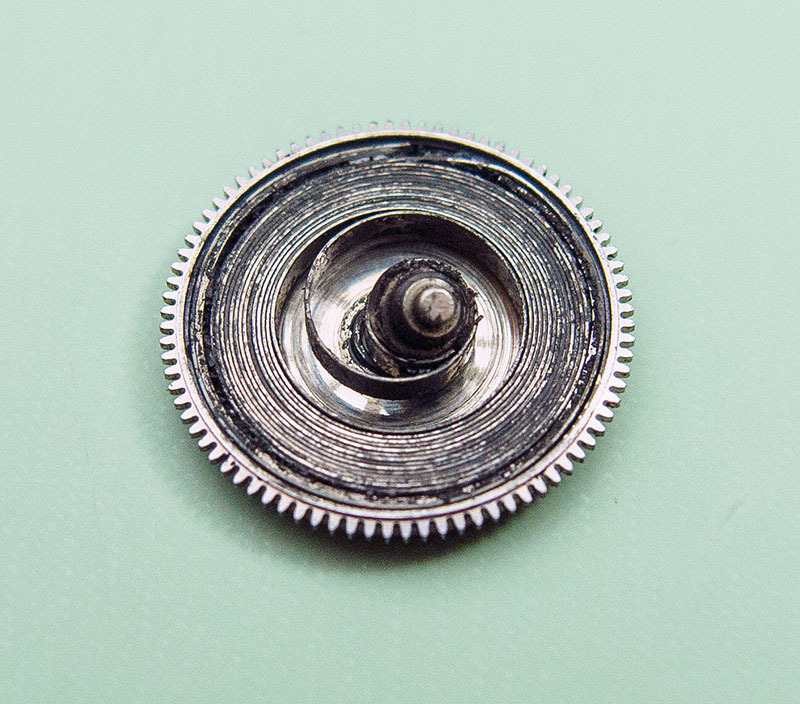 With the dial away with James Hyman for its relume, we can appraise the movement, dial side first. and with that removed we see too on this side of the movement, barrel grease congealed around the upper barrel arbor hole in the barrel and train wheel bridge. Now, let’s look at the second feature which distinguishes the 6306 from the 6309 movement. 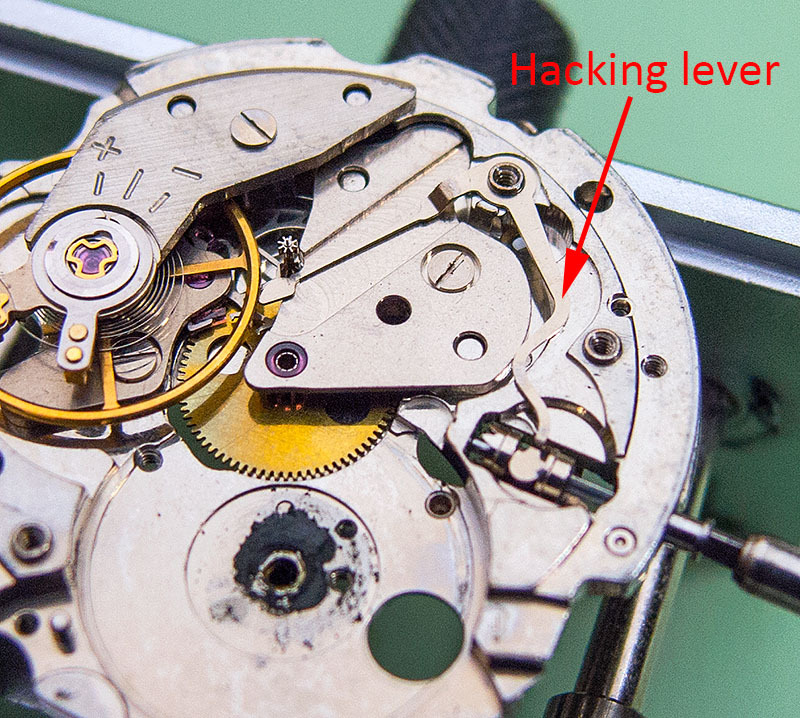 In every respect, bar the hacking lever and centre wheel bridge (which sports a groove in the 6306 to accommodate the hacking lever), the 6306 and 6309 movements are essentially identical from the train wheel bridge down. The bridge itself however, is where those additional four jewels lie. and a close up of one of the springs part way through being refitted over the cap jewel, post clean. 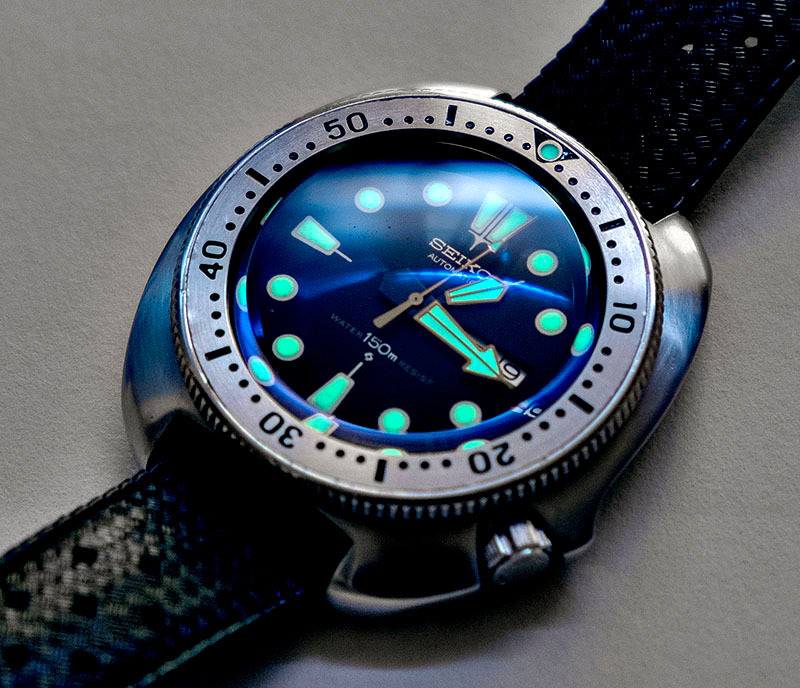 The lume colour, incidentally, had been very nicely matched to that of the hands by James Hyman who has also also followed the outline of the original lume with great precision. Before we fit the movement to the case, there is one last task to take care of. The original stem fitted to the crown was obviously a 6105 stem and is incompatible with the 6309/6 movement. 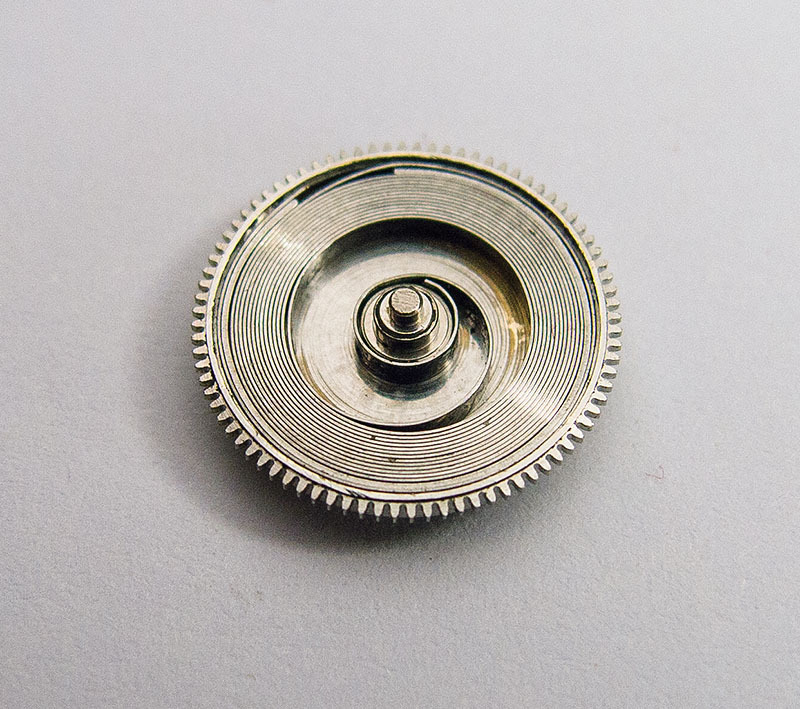 I removed the original stem and fitted a 6309 dress watch stem but the problem with 6309 stems is that they are intended for cases with a wider bore crown tube and do not, therefore, fit down the relatively narrow 6105 tube. Before fitting the dress stem then, I had to take off some material to narrow the stem at the offending position, enabling it to pass unhindered down the tube. 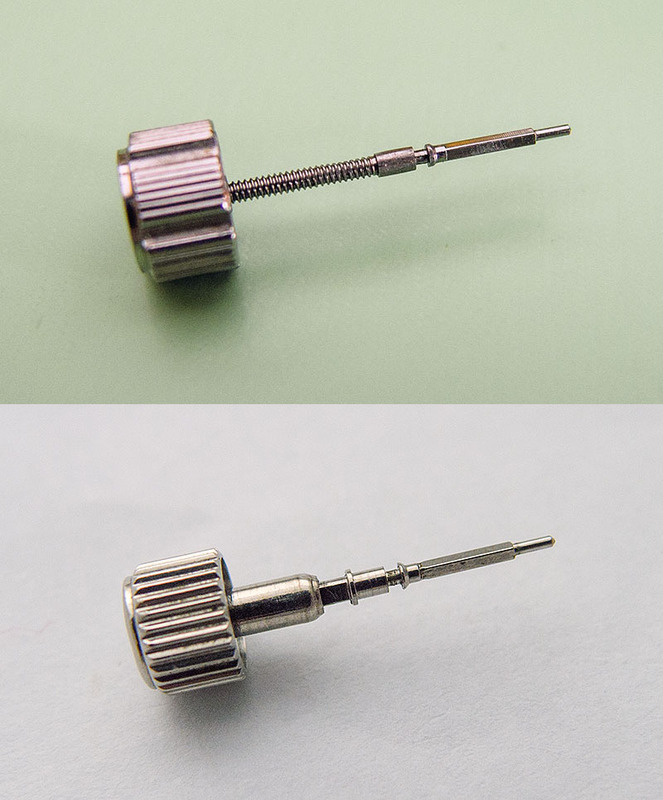 Here’s a comparison of the modified 6309 stem fitted to the 6105 crown (top) with the crown and stem from the 6306 sports diver (bottom). 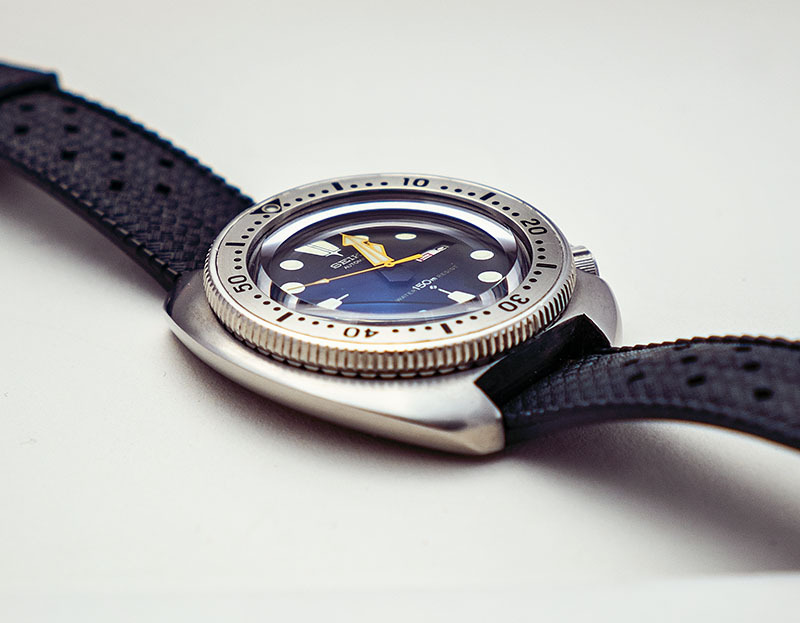 As I suggested at the start, there is always a danger with any modified watch that the end result is not necessarily something which will appeal to a more general audience anything like as much as it appeals to its creator. The internet is festooned with all manner of truly ghastly creations but also some beautifully judged and executed work. I don’t pretend any of mine fall into the latter category because in my increasingly infrequent diversions into moddery, I generally find myself running up blind aesthetic alleys only to really appreciate them as such when viewing them with fresh eyes after a period hidden away. But this one, at least in my opinion, just about hangs together sufficiently well to be sure that I won’t be returning to inflict any further tweaks. Great Work Martin! I truly enjoy your tutorials! 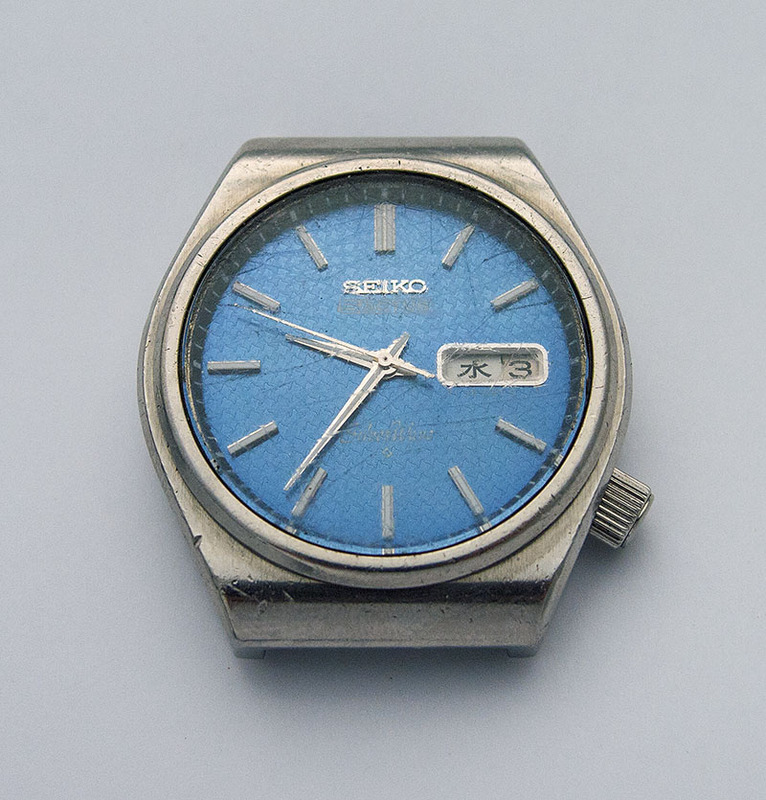 No, it’s the original 6105 bezel but with an insert from a Seiko SBBN007. 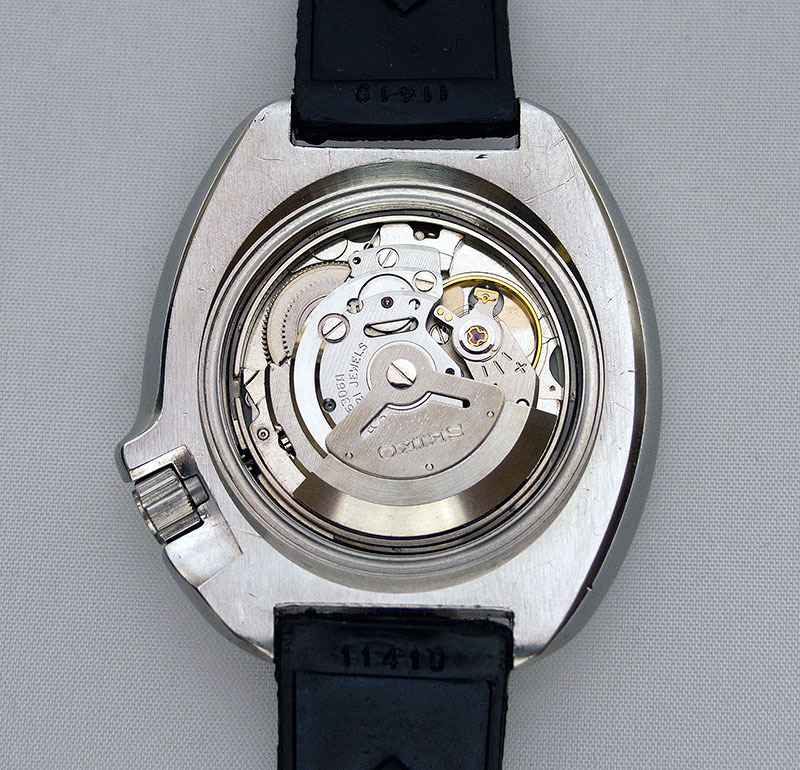 What model is the donor watch with the 6306 movement? Saw one on Ebay that looks identical to your photo but with a 2906-0198 serial number at the case back? Thanks. The one featured in the post is a 6306-8010. I suspect that the watch you saw was a ladies-sized equivalent, featuring the 2906 calibre, a high-beat movement only 18mm in diameter. 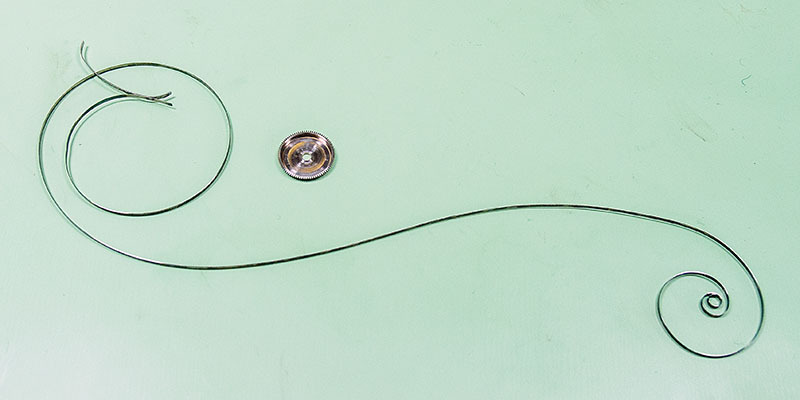 The 6309 stem came from a watch material house as a spare part and not from a donor watch. The length, as far as I know, is standard and you trim to fit the case. You should be able to see from the comparison photo featuring the 6306 stem, the part of the stem that has been reduced. Good luck with your project. Thank you Martin I’ll try and find a suitable stem. Martin do you have any leads on a bezel for the 6105-8000 ? Richard, no leads on a bezel I’m afraid. Just keep scanning Ebay and watch forum sales corners. 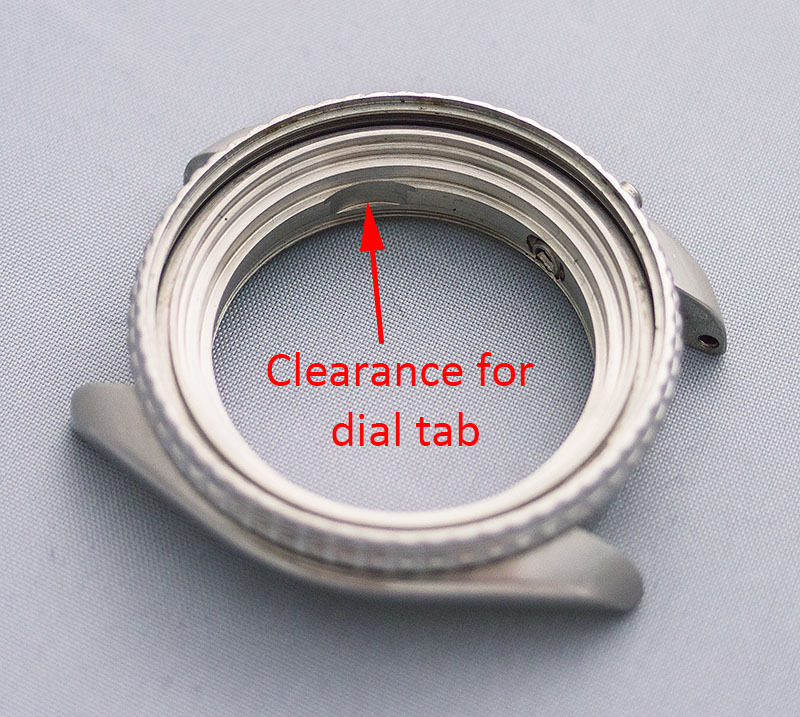 If you have the turning ring but not the insert then you can adapt an insert from, say, an SKX007 but if the turning ring itself is missing then you may be in for a long wait. Martin how did you go about fitting the movement ? I didn’t see that covered in the tutorial. 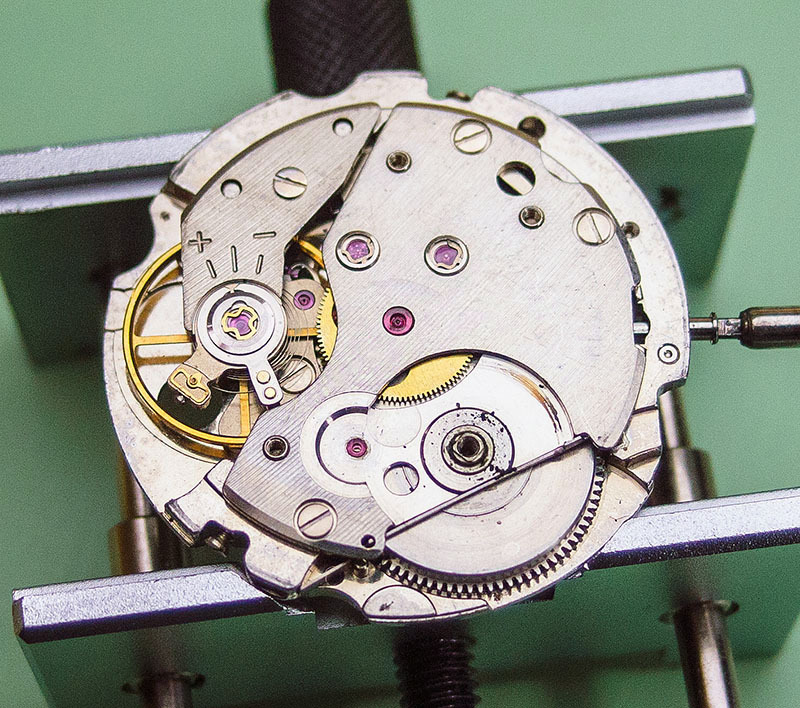 Did you use a 6306 movement ring or a 6105 one? Or something different all together? 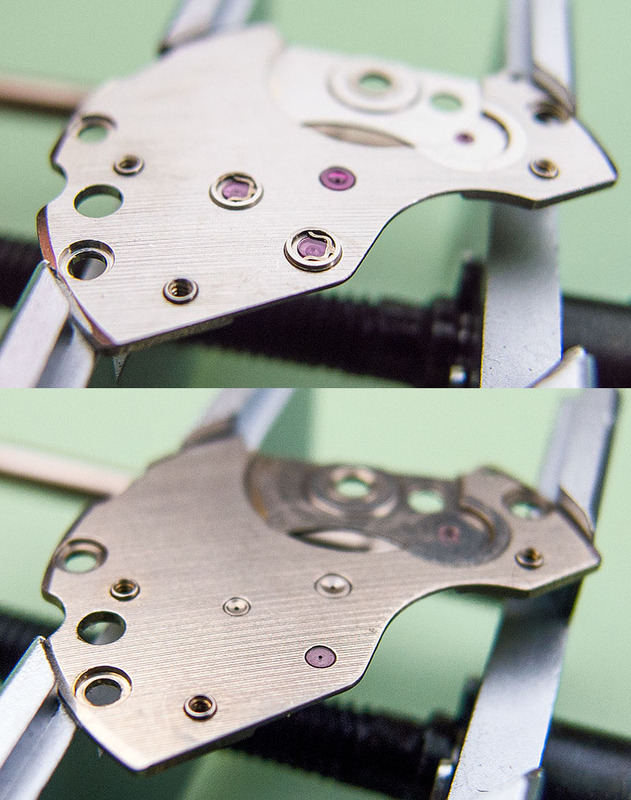 The movement is a straight drop-in – same diameter and same stem height. 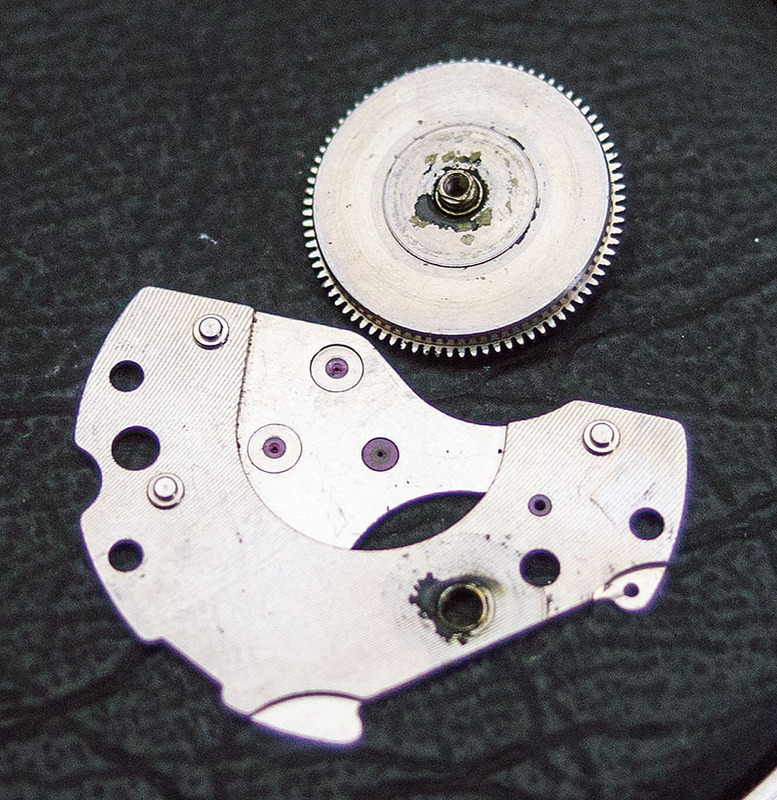 As far as I can recall, I used a Seiko 6105-8110 movement ring – I think the part number is 83108945. Quick question for you. 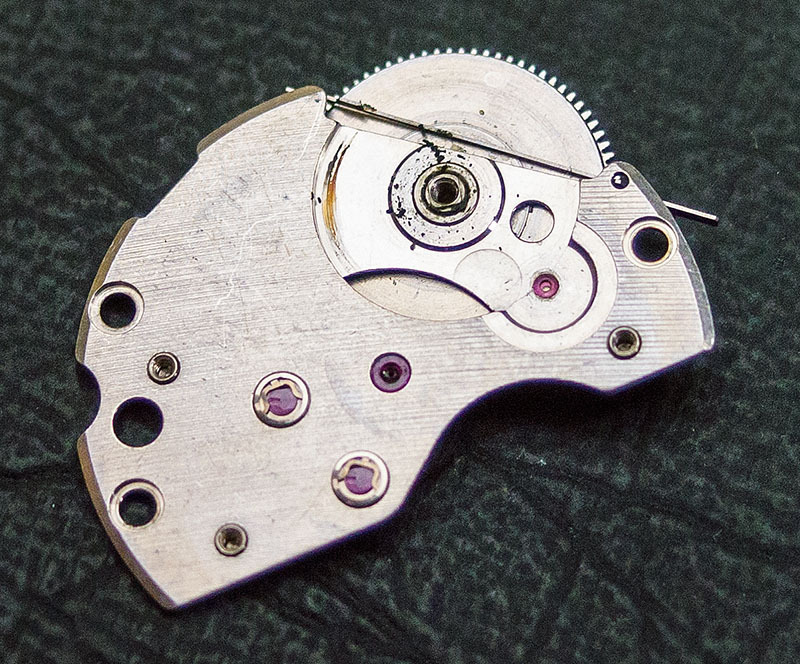 I’ve got the possible chance at buying a completely original 6105-8110 from my watchmaker. 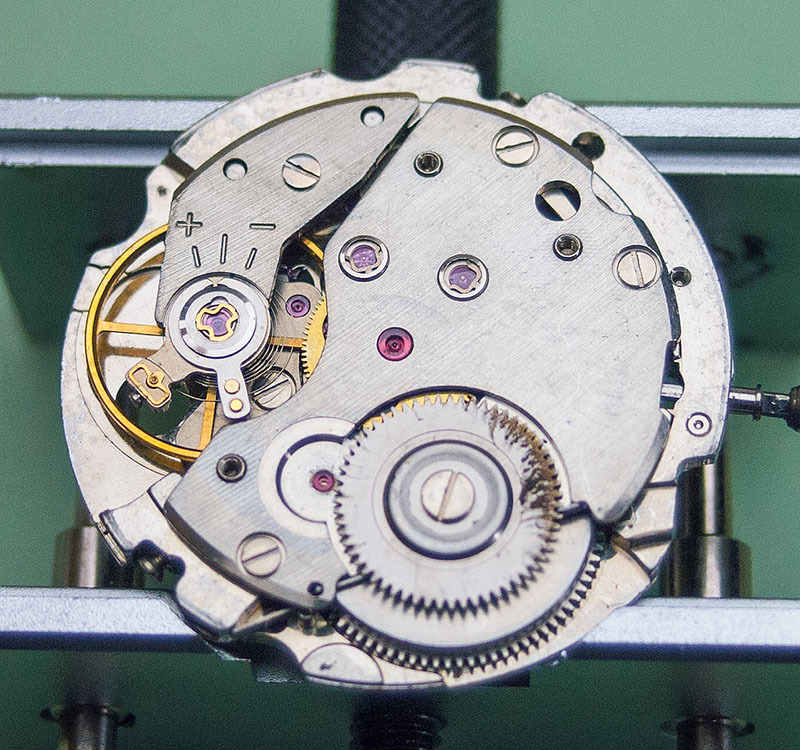 He has made comments about restoring them (more specifically early Seiko auto’s in general as he doesn’t seem to be aware of the movement differences) and noted that he was always having to up-jewel the movements because of the bushes wearing out. I notice you do a similar method here by swapping the plate entirely. 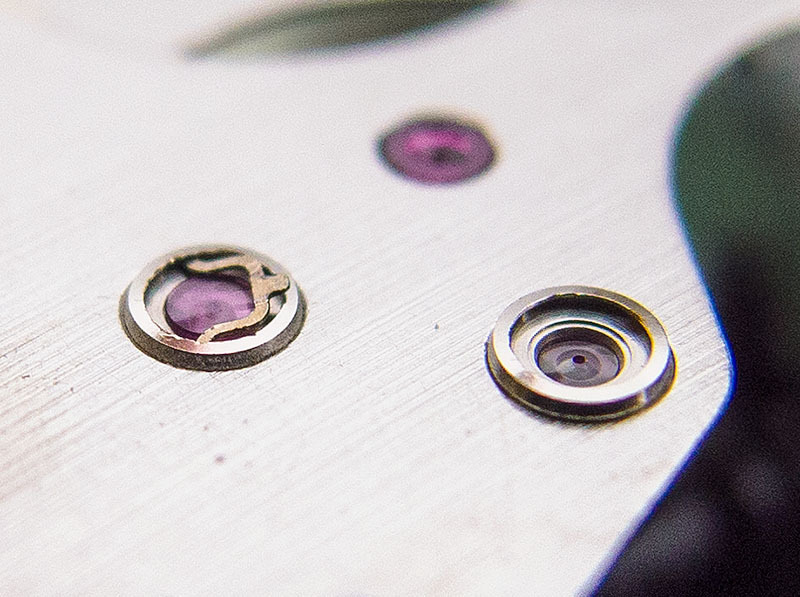 My question is this – Which movement would be a good donor to use parts from to up-jewel a 6105 movement? Much in the same way you can use a 6306 to up-jewel a 6309. Thanks, and appreciate any advice. Arguably the part most vulnerable to wear in the 6105 is the main plate barrel bush but there is no removable bush there and so any repair would probably require reaming and fitting of a separate bush. However, the architecture on the calendar side might make that problematic and even with space allowing, I suspect finding a matching jewel/barrel arbor pair might be challenging. Nevertheless, to answer your question, the only option for a higher jewel count main plate would be the high beat 6159 but the cost of that would most likely be prohibitive and a donor movement would be very difficult to source. 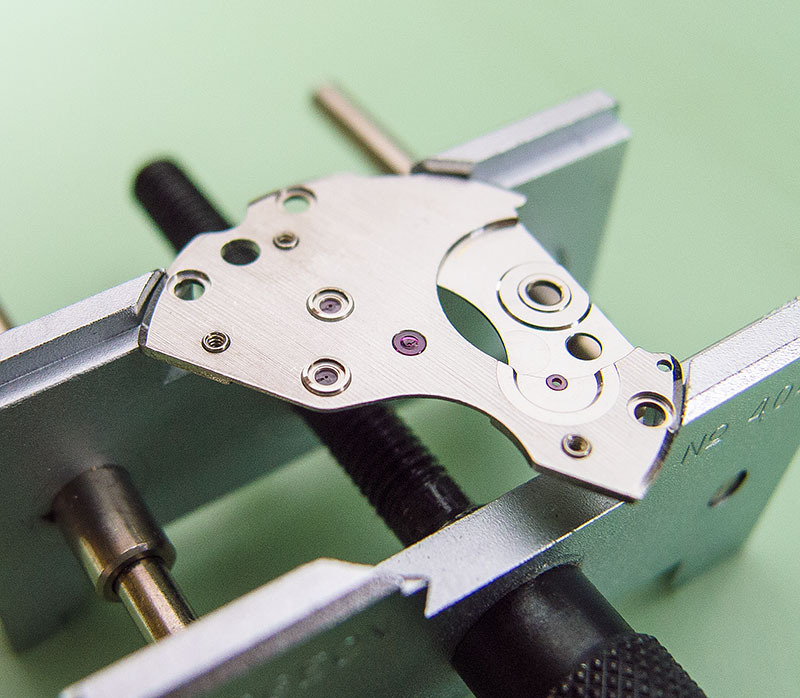 None of the 6106 or 6119 variants will work because they use push quickset mechanisms that are incompatible with the design of the 6105 case tubes. So you are then stuck with the 6105A, 6105B or 6117, all of which are basic 17 jewel designs. However, the 21 jewel variants of the 6119 and 6106 could offer up higher jewel count bridges but you would then need to take care that the train wheels were compatible, say with a diafix setting at one end and a standard jewel or bearing at the other. The bottom line is that unless you want to swap out the 6105 with something like a 6306 or 6319, you are stuck with the 6105 main plate and 6119/6106 for other parts. Good luck! 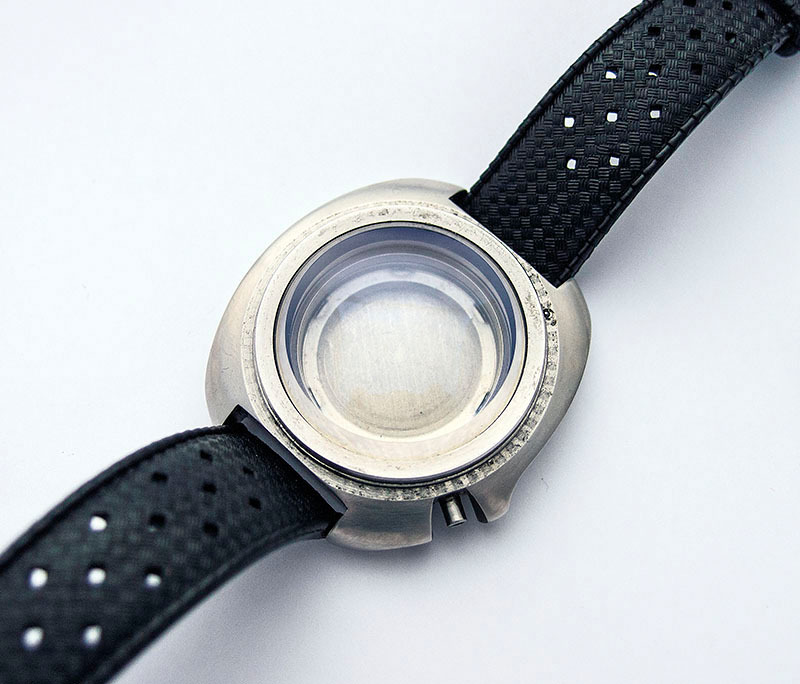 As I recall, that one was a high profile sapphire from 10watches.com (now Dagaz). I am not sure if they still supply them as it’s been ages since I’ve looked at their site. 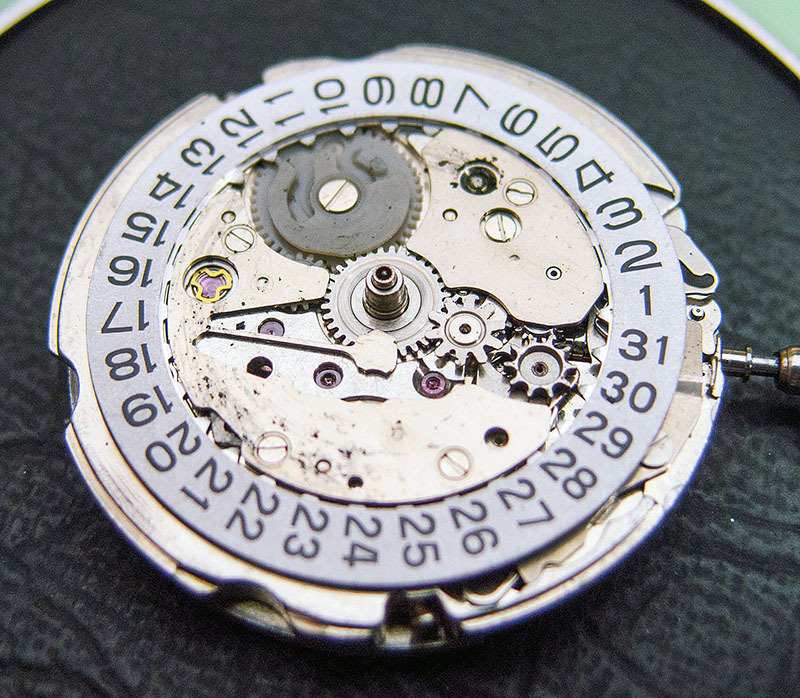 What dial holding ring did you use on the 6306 movement and 6105 case? 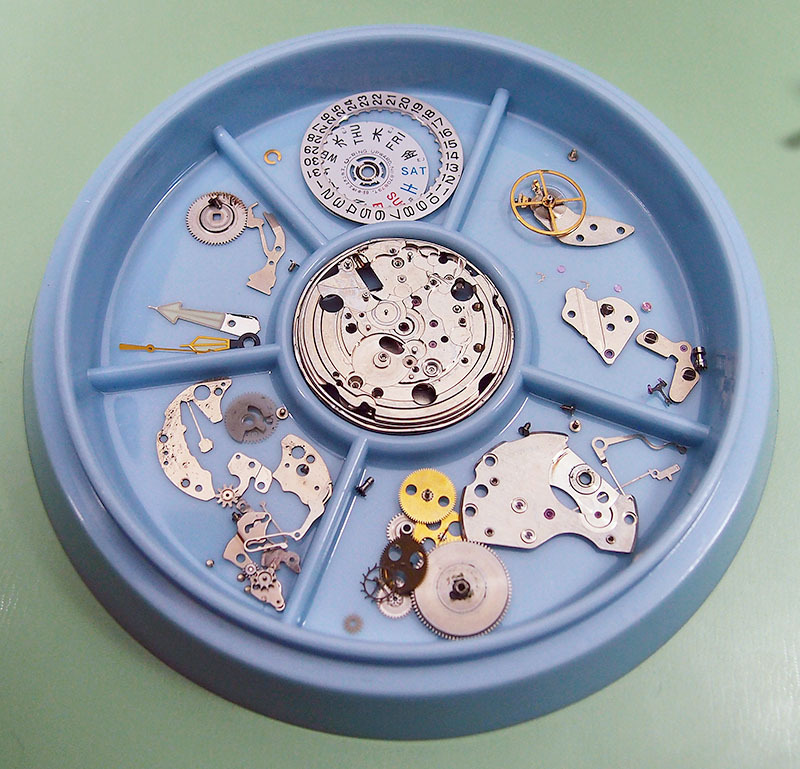 This was a little while ago now but I am pretty sure I will have used the dial ring that came with the 6306 donor. 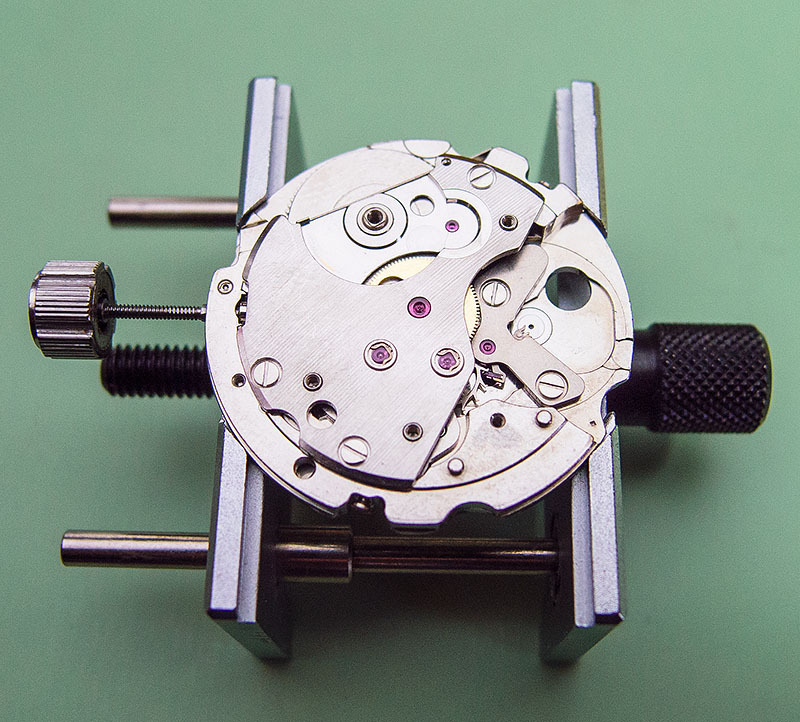 Thks for you prompt reply….Did you still use the movement holding ring? Your pictorial and subjective commenting are very nicely detailed. Enough that I have perused a few times. Thank you for archiving your build and sharing Martin. Thanks Bobbie. Your appreciation is appreciated!